Bringing outdoor rooms to life is what Gensun is all about. The furniture is high quality, highly detailed and available at an affordable price. Customer service, customization and timely deliveries are some of the company’s key attributes. 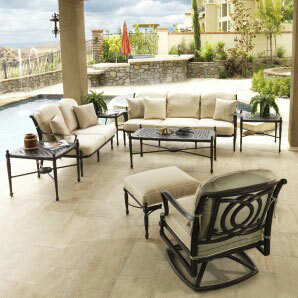 They manufacture casual and outdoor furniture for both the residential and commercial markets. The products are primarily cast aluminum or cast and extruded aluminum available in cushion, sling or outdoor wicker options. Gensun is a family company. As the manufacturer they provide their customer with direct, timely and unparalleled support. Come visit Allied Pools today to try out and learn more about the options available from Gensun. Gensun employees take great pride in knowing that the customer’s needs are fulfilled with complete satisfaction before, during and after the sale. It is their goal that this satisfaction is passed on to others through the enjoyment that their furniture can provide. Gensun is the proud recipient of the 2010 Manufacturer Leadership Award for cast aluminum products. This award is presented to the best manufacturer in the industry based on design, quality, customer service, business ethics, communication, merchandising and trade relations. Gensun is the manufacturer and therefore controls all aspects of the production process from the foundry to the service after the sale. The company uses the best materials, pays meticulous attention to detail, uses state of the art machinery and processes, offers beautiful designs and backs it up with service that is second to none. 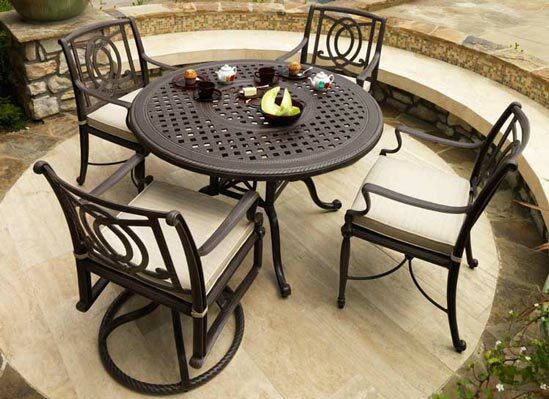 You can be sure that your new patio furniture from Gensun will last for years to come. 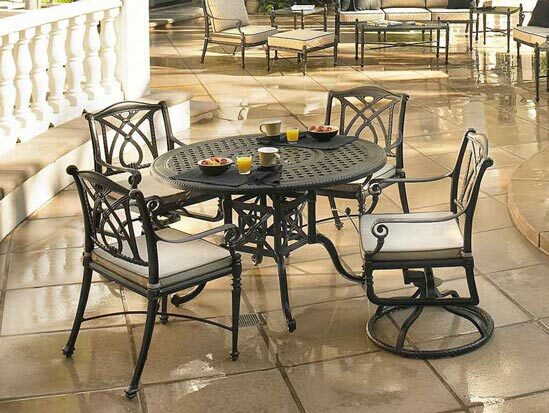 Gensun produces highly polished, highly detailed, super pure cast aluminum or cast and extruded aluminum furniture. They use all stainless steel hardware, high density nylon bushings and levelers. They use a powder-coated finish that utilizes a multi-step wash process to ensure the longest lasting and most durable finish available in today’s market. Gensun offers over 280 high quality outdoor fabrics available year round and with a mold and mildew resistant core they are sure to stand the test of time. 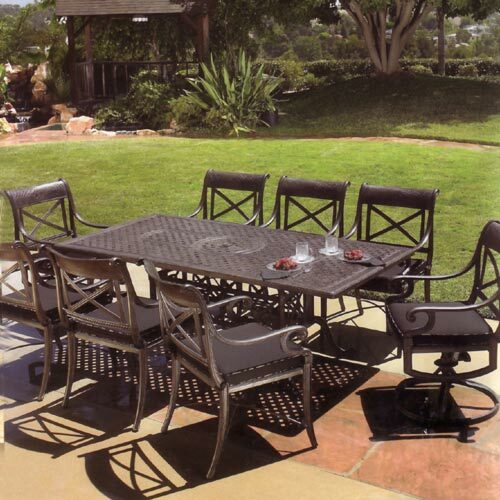 Gensun casual and outdoor furniture is manufactured to give many years of enjoyment. In an effort to help you enjoy the furniture over the years we highly recommend a regular schedule of care and maintenance. Failure to follow these guidelines can void the warranty. 15 Year Residential Warranty (Read Complete Warranty).